I've said it several times here lately, but I really feel as though this is the first year that I'm really enjoying our garden. For the first time I've been able to keep on top of the weeding and make sure that the beds and gravel areas are fairly clear. I've also tackled a few larger jobs, like clearing out the ivy and other rubbish from behind the summerhouse, pulling away the climbing plant that was engulfing our garage, and removing all of the large pots that had been left behind by a previous owner and were mainly full of dead plants. This has been the year that after much deliberation we finally purchased some decent garden furniture - a small sofa, two arm chairs and a little table. We've been eating outside, and it's nice to have somewhere that I can sit quietly for a little while when the children are playing. Along with this has come the inspiration to make the garden look a little prettier, and so I thought I'd share some of the things that I've done over time to add a bit of interest and fun. I made my sunflower mosaic stepping stone a few years back, and I've finally found a place to display it permanently in the garden. It was bought as a kit and I was very pleased with it. I have a second one which I bought at the same time and have yet to complete, it's a poppy and I really do need to get on with it. If you are interested you can buy the kits from here - Tracey Cartledge stepping stone mosaic kits - and I'd really recommend them. The circular base tray is reusable and I'll have plenty of bits of tile left over, so I'd also like to make a couple more to my own designs. Eventually perhaps I'll have a path across the grass to our summerhouse so it's more accessible when the grass is wet. 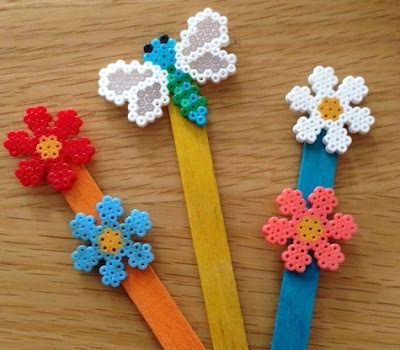 I've brightened up some of my pots with these mini Hama bead decorative plant markers. They've lasted well outside in a sheltered spot, and are easy enough to replace when the wooden sticks become damaged. Recently I wrote about getting to know my new sewing machine, and making some pretty bunting and curtains for our summerhouse. I'm really pleased with it, and every time I look out of the window and see our summerhouse it makes me smile. 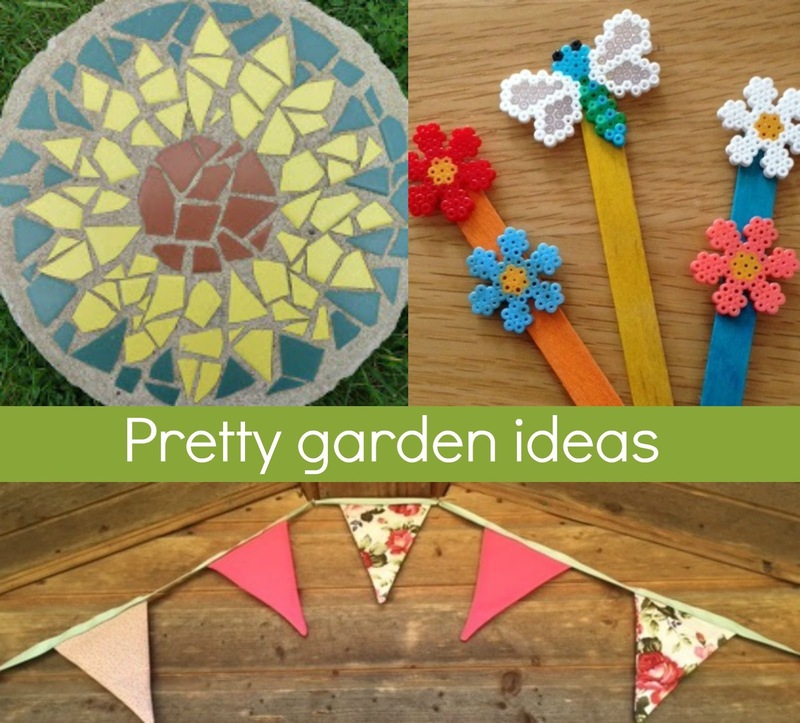 Bunting is very popular at the moment and it's so easy to make, you can easily make no sew bunting which is durable enough to last outdoors for at least the summer, and then you can replace it to keep things interesting. I'm definitely going to be making some more for elsewhere in the garden, we have a little trellis fence that separates off our vegetable patch and it needs something to cheer it up a bit! Our garden is still very much a garden for the children, and so I like to have a few things in it that make it fun for them. We have a little sand table, and last year I dumped in a big handful of sequins and glitter that were left over from a craft project. It makes the sand a lot more fun to play in, and adds to their play - I've seen them making 'cakes' which they decorate with the shiny sequins. On a similar note I cut several 'dinosaur bones' out of some white plastic that we had lying around and hid them in our larger sandpit for them to play excavations with. Our latest project has been painting some of the pine cones that Mia likes to collect on her way home from nursery. I'm not quite sure what we are going to do with them yet, and I'm not sure that they'll every look as good as these that I saw, but they should bring a little bit of colour to the garden! 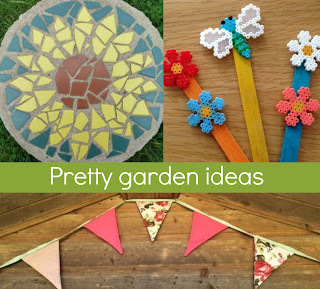 I hope that you liked seeing some of my ideas, and I've been collecting even more inspiration in my Garden Style board on Pinterest, take a look! Follow Jennifer Jain's board Garden style on Pinterest. Thank you, I'm hoping to come up with a few more ideas over the winter ready for next summer! Thank you! I really need to get on with the other mosaic kit that I have, definitely need to make it a project to complete ready for next year!